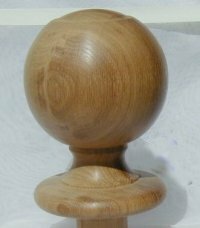 Turned wooden Newel caps, can be purchased from a standard range. They can also be made to drawings, photo's or originals copied. These stairparts ar available in a range of timbers. 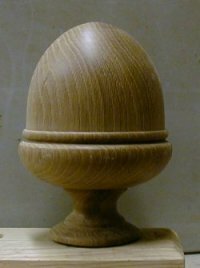 By far the most popular style of turned newel cap. An alternative to the taller caps. This section also includes square stair caps. Above: Pitch pine newel caps made to match existing. Made to measure, bespoke caps. Take a look at this section if you would like to have caps turned to fit existing posts and staircase, or turned to a style of your choosing. Alternatively you can have a cap or set of caps made to match your existing ones.